Our focus for this newsletter is Big Local partnerships: the groups that are responsible for guiding the overall direction of Big Local in each area. We know that each partnership has its own way of working, and our guidance explains three different approaches. We're also supporting partnerships to spread the word about their Big Local activities with new guidance on websites, newsletters, social media, working with local press and communications generally. Since I last wrote we've welcomed our Big Local ambassadors. These volunteers are helping to communicate nationally and locally about Big Local, especially in the press and at events. For this newsletter, they've also contributed to blogs and videos that bring to life new research on the skills and roles that help Big Local partnerships succeed. For the 138 partnerships that we have endorsed so far, our annual partnership review is in progress, which means that we are asking Big Local reps to submit updated information about membership of partnerships. You can find out more below, and do speak to your rep if you have any questions. Looking ahead, preparations are underway for spring events 2016: check the list of locations at the end of this email and save the date! Research by the Community Development Foundation has identified six different roles that help partnerships succeed: Strategic thinker, do-er, catalyst, connector, advisor and coach. 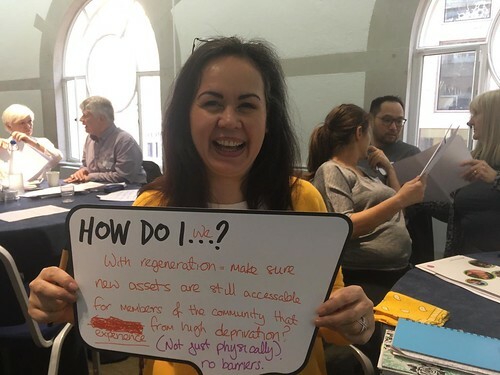 We asked our Big Local ambassadors to help explain what the roles look like in practice and to explain how you can make sure you partnership stays strong. Read more. Tang Hall used their Big Local plan launch to celebrate their area, change attitudes and get more people involved in Big Local. Get inspired by the list of activities from Tang Hall's event, which were successful in attracting a wide range of different people and ages. Read more. The 16 Big Local ambassadors will help us represent Big Local nationwide. They are getting involved with local and national media work, events and other opportunities to talk about the positive difference that Big Local has made for them and their area. In a 2 minute video, you can hear some of the ambassadors explaintheir role, and why they wanted to take part. Read more. Membership of your partnership will change over time, as new people join and others step back. So, we ask your Big Local rep to submit updated information about partnerships between September and December each year. This is to make sure we know who is in the Big Local partnership and that it continues to meet the criteria. The review also makes sure we have the right contact details and information on the age, ethnicity and gender of partnership members so we can see what types of people are involved across the programme and how this changes over time. Do get in touch with your rep if you have any queries. Getting people involved: This one day event will help you involve people in Big Local, and build the commitment and skills of your community. Wednesday 2nd December, in Sheffield. More details. Being the best me: This course allows you to explore what it is you want, what gets in the way of you feeling confident and how you can build your confidence. Saturday 16th January, in London. More details. Sorting out arguments and disagreements: Learn how to reduce, prevent and resolve arguments and conflict. Wednesday 10th February, in Newcastle. More details. Interested in these sessions but can't make the date or venue? We can also arrange training at a time and place to suit you if there are a few people in your Big Local area who would like to be trained on a particular topic. For more information, speak to your rep or contact leila.wong@localtrust.knightstudiosdevelopment.com. Wellbeing, health and Big Local: This workshop will look at what some Big Local areas are already doing on wellbeing and at how any area can develop work with health service organisations. Thursday 3rd December, in Birmingham. Read more. Community hubs: the practicalities of governance and management: This day will provide a practical guide to managing a community hub. Includes a mini marketplace of stalls with advice about governance, funding, marketing and insurance for community hubs. Saturday 23rd January, in Essex. Read more. Big, green and local: Planning and implementing environmental projects: Presentations and workshops with four different organisations currently working with local communities on environmental projects. Saturday 30th January, in Ashford. Read more. Spring events: save the date! Every year our spring events are a fantastic opportunity for people from Big Local areas across the country to get together, get inspired and get skilled up. We're running fewer, bigger events this year with three on a Saturday to encourage even more residents to attend. At the events you'll hear community success stories from inside and outside Big Local, take part in workshops and leave with lots of new ideas. Booking is not yet open, but you can save the date that suits you best. We're starting to contact speakers for all dates so if you're interested in contributing do get in touch.